The old quarter of Caceres, which was declared a World Heritage Site by UNESCO in 1986, is one of the most complete and best conserved town centres in Europe. It consists of buildings from the Middle Ages and the Renaissance. The city wall divides its space into two main areas. 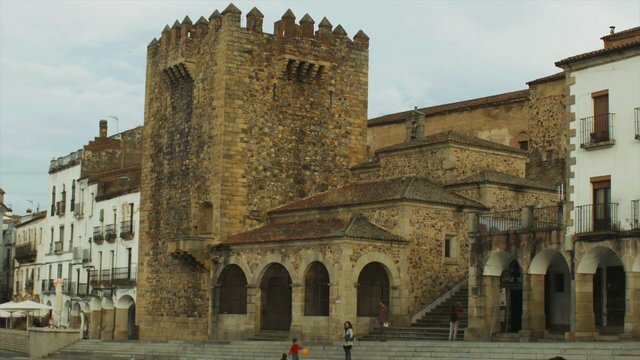 Inside the city walls, we find the lion's share of the best known buildings of this city, such as the Cathedral of Santa María, the Palacio de las Veletas, the palaces of the Golfines, la Casa del Sol or the Bujaco Tower. But the true origin of the city and of its old quarter goes back to 34 B.C., the year in which Gaius Norbanus Flaccus founded the Norba Caesarina, which is now Caceres. This town was reconquered by Alfonso IX on 23 April, 1229, on St George's Day, who since then has been its patron saint. From that date on, many palaces and monuments were built, buildings which you can now see in the old quarter, and which were at their peak during the Catholic Monarchs era (fifteenth and sixteenth centuries). If you want to explore the past history of the old quarter in greater depth, you have to visit the city's museums: the Caceres museum in Plaza de las Veletas, where you will find the archaeological remains found in the city; the exhibition centre on the ramparts of Santa Ana, and the provincial Council building. The Caceres Holy Week, which draws tourists from all over the world, has its own special museum in the Church of La Preciosa Sangre.